It’s hard to describe just how small of a space the tasting room at Standard Brewing is to someone who has not been there. It’s tiny. 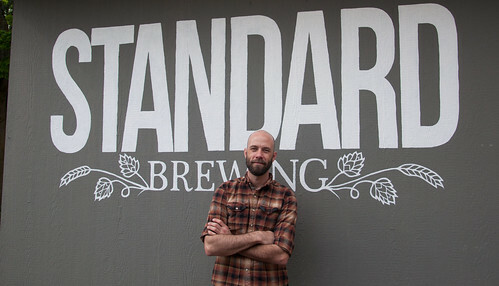 Owner Justin Gerardy opened the nanobrewery at 25th and Jackson in the Central District back in March 2013, and he’s probably been dreaming about expansion since the very beginning. Well, that day is finally here. Justin will be expanding the brewery at its current location, including taking over the space next door, where he’ll build out a larger bar area featuring food, liquor and house beers. In addition, Justin will be expanding the patio space, putting in a larger brewing system, a yeast lab and adding oak barrels for aging & sour beers. Cheers to Justin for sticking in the Central District. Keep reading the press release below for much more information.